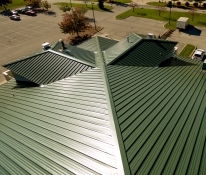 Metal roofing systems are some of the longest lasting roofing options on the market today. With proper maintenance and care, a metal roofing system can last for at least 60 years. However, even the longest lasting roof will eventually need to be replaced or recovered. Recovering an existing metal roof with another metal roof is often an excellent option, providing a number of advantages and offering building owners recover system options. Metal to the Metal: Re-covering Existing Metal Roof Systems Requires Diligence by W. Lee Shoemaker, Ph.D., P.E., Vincent E. Sagan, P.E., and Dale Nelson, first published in Professional Roofing Magazine, takes a deep dive into metal roof recover and replacement considerations, focusing on the benefits and advantages of recover. They do acknowledge, however, that, “The advantage of replacing a roof system is it allows any existing vinyl-faced insulation, which may have deteriorated over time, to be removed and replaced.” When replacing a roof, however, the amount of time that the building and its contents are exposed to the outside environment can be significant. There is also typically a disruption in the use of the building during the replacement process, which can mean downtime and lost revenue for any businesses operating out of the building. These advantages often mean that recover is often the least expensive and more advantageous option for building owners. Click here to read the full article and learn more about how each of these considerations affects the metal roof recover system. 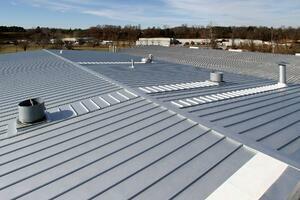 Contact us to learn more about metal-over-metal roof recover systems.